For the hall of fame of Canada, see Canadian Songwriters Hall of Fame. The Songwriters Hall of Fame (SHOF) was founded in 1969 by songwriter Johnny Mercer and music publisher/songwriter Abe Olman and publisher/executive Howie Richmond to honor those whose work represents and maintains the heritage and legacy of a spectrum of the most beloved songs from the world's popular music songbook. It not only celebrates these established songwriters, but is also involved on the development of new songwriting talent through workshops, showcases and scholarships. There are many programs designed to teach and discover new songwriters. Nile Rodgers serves as the organization's chairman. There are numerous examples of collaborating songwriters being inducted in unison, with each person being considered a separate entrant. The inaugural year featured 120 inductees, many of whom had a professional partnership, such as Rodgers and Hammerstein. Burt Bacharach and Hal David followed in 1972. Betty Comden and Adolph Green were selected in 1980, and Lieber and Stoller were inducted in 1985. John Lennon and Paul McCartney were inducted in 1989 along with Gerry Goffin and Carole King as well as Barry Mann and Cynthia Weil. Motown's Holland-Dozier-Holland team were honored the following year. Elton John and Bernie Taupin were among those chosen in 1992, and the pop music group the Bee Gees had all three brothers inducted in 1994. 1995 saw Gaudio and Crewe and Gamble and Huff. The Eagles' Glenn Frey and Don Henley were co-inductees in 2000. Queen was the first rock band to have all their band members inducted in 2003. Five members of Earth Wind & Fire were in the class of 2010, and four members of Kool and the Gang were honored in 2018. The Abe Olman Publisher Award is given to publishers who have had a substantial number of songs that have become world-renowned and who have helped to further the careers and success of many songwriters. The Board of Directors Award is presented to an individual selected by the SHOF Board in recognition of his or her service to the songwriting community and the advancement of popular music. The Contemporary Icon Award was established in 2015 to recognize songwriter-artists who attained an iconic status in pop culture. The American singer Lady Gaga was the first artist to win the award. The Hal David Starlight Award, created in 2004, was renamed in honor of the SHOF Chairman for his longtime support of young songwriters. Award recipients are gifted songwriters who are at an apex in their careers and are making a significant impact in the music industry via their original songs. The Howie Richmond Hitmaker Award is specifically tailored for artists or "star makers" in the music industry who have been responsible for a substantial number of hit songs for an extended period of time, and who recognize the importance of songs and their writers. 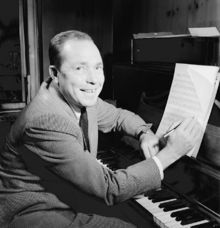 The Johnny Mercer Award is the highest honor bestowed by the event. It goes to writers already inducted into the Songwriters Hall of Fame for having established a history of outstanding creative works. The Patron of the Arts is presented to influential industry executives who are not primarily in the music business but are great supporters of the performing arts. 1990 – Edgar Bronfman Jr. The Pioneer Award was established in 2012 to recognize the career of a historic creator of an extensive body of musical work that has been a major influence on generations of songwriters. Named for the former President of the Songwriters Hall of Fame, the Sammy Cahn Lifetime Achievement Award is given to individuals or teams who are recognized as having done a great deal to further the successes of songwriters. Abe Olman was an American songwriter and music publisher. He was later director of ASCAP, and a founder of the Songwriters Hall of Fame which, in 1983, named the Abe Olman Publisher Award. In his honor, the Abe Olman Scholarship is given out each year by his family in the interest of encouraging and supporting the careers of young songwriters. Created In 2009, The Holly Prize is a tribute to the legacy of Buddy Holly, a SHOF inductee. The award recognizes and supports a new "all-in songwriter" — an exceptionally talented and inspired young musician/singer/songwriter whose work exhibits the qualities of Holly's music: true, great and original. The Holly Prize is administered and juried by the SongHall. Announced in 2011, along with a collaboration between the Songwriters Hall of Fame and NYU Steinhardt's Department of Music and Performing Arts Professions, the NYU Steinhardt Songwriting Scholar Award is presented to a music composition student whose work holds great potential for success in the field, and embodies the art, craft, individuality and qualities of communication of the best songwriting. The Towering Performance Award is given in recognition of one-of-a-kind performances by one-of-a-kind singers that have recorded outstanding and unforgettable interpretations of songs that have become iconic standards. The Towering Song Award is given to creators of an individual song that has influenced the culture in a unique way over the years. Created in 2013, The Visionary Leadership Award recognizes members of the Hall of Fame Board of Directors who have made a significant contribution in furthering the ongoing mission of the organization. ^ "Nile Rodgers Appointed Chairman of the Songwriters Hall of Fame: Exclusive". Billboard. Retrieved 2018-07-05. ^ "About Us". Songwriters Hall of Fame. Retrieved June 14, 2015. ^ "Songwriters Hall of Fame Honorees Range from Gaga to Grateful Dead". Variety. June 18, 2015. Retrieved June 19, 2015. ^ "Abe Olman Publisher Award". The Songwriters Hall of Fame. Retrieved June 14, 2015. ^ "Board of Directors Award". The Songwriters Hall of Fame. Retrieved June 14, 2015. ^ "Lady Gaga To Receive First-Ever Contemporary Icon Award". Songwriters Hall of Fame. April 23, 2015. Retrieved June 14, 2015. ^ "Hal David Starlight Award". The Songwriters Hall of Fame. Retrieved June 14, 2015. ^ "Howie Richmond Hitmaker Award". The Songwriters Hall of Fame. Retrieved June 14, 2015. ^ a b "Songwriters Hall Of Fame Celebrates The Best Of Songwriting Legends". The Songwriters Hall of Fame. Retrieved June 16, 2015. ^ Christman, Ed (March 10, 2011). "Barry Mann And Cynthia Weil To Receive Johnny Mercer Award At 2011 Songwriters Hall Of Fame Event". Billboard. Retrieved June 14, 2015. ^ "Johnny Mercer Award". The Songwriters Hall of Fame. Archived from the original on June 23, 2015. Retrieved June 14, 2015. ^ "The Johnny Mercer Award Winners". The Johnny Mercer Foundation. Retrieved June 16, 2015. ^ "Patron of the Arts". The Songwriters Hall of Fame. Retrieved June 14, 2015. ^ "Highlights From The 2012 Songwriters Hall Of Fame Awards". American Songwriter. Retrieved June 16, 2015. ^ "Berry Gordy to Receive Pioneer Award From Songwriters Hall of Fame". Rolling Stone. Retrieved June 16, 2015. ^ "Sammy Cahn Lifetime Achievement Award". The Songwriters Hall of Fame. Retrieved June 14, 2015. ^ "Abe Olman Scholarship". The Songwriters Hall of Fame. Retrieved June 14, 2015. ^ "The Holly Prize". The Songwriters Hall of Fame. Retrieved June 14, 2015. ^ "The NYU Steinhardt Songwriting Scholar Award". The Songwriters Hall of Fame. Archived from the original on July 1, 2015. Retrieved June 14, 2015. ^ "Towering Performance". The Songwriters Hall of Fame. Retrieved June 14, 2015. ^ "Towering Songs". The Songwriters Hall of Fame. Retrieved June 14, 2015. ^ "Songwriters Hall Of Fame Celebrates The Best Of Songwriting Legends". The Songwriters Hall of Fame. Retrieved June 16, 2015. ^ "BMI Head Del Bryant to Be Presented With Visionary Leadership Award at Songwriters Hall of Fame". The Hollywood Reporter. Retrieved June 16, 2015. ^ "ASCAP CEO John A. Lofrumento To Be Honored With Visionary Leadership Award". The Songwriters Hall of Fame. Retrieved June 16, 2015.